There will be days that you may run out of blog ideas. You haven't written any new ideas in your notepad, and you cannot just think of anything good. This may be frustrating to you. I can imagine you just staring at blank page, not knowing where to begin. Cheer up, I know where you can get some blog topic ideas when you need it. Remember to use this means to also plan future blog posts. If you have a post strategy, you will not worry as much. It's one thing to keep producing content with no strategy, aim or direction. If you do this then this post is for you. And it's another thing to actually post content that your audience would want to share to their friends easily. 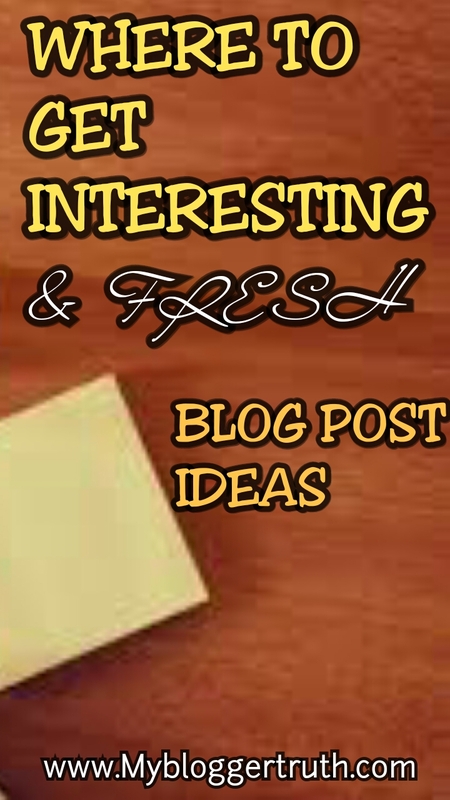 In this article, I will be letting you in on how to generate amazing blog ideas the smart way. You might need to write this down. How to generate post ideas? What other way to generate blog ideas other than from your audience - you know people that actually READ what you write. Focus on the recurring questions in the comments box, interact more with your audience, understand your audience, or you can down-right ask them what their issues are and what they would like to see more. It does not matter how many contents you write, there would still be a particular content that stands out amongst the rest. The one that got more popular and had the most shares. Let your competitors influence your next blog posts by searching for their most shared posts. Find out what their audience liked, use Buzzsumo for that. All you need to do is type in your competitors URL. Now steal their content ideas and create your own Version of it - With a different title and "content" of course. 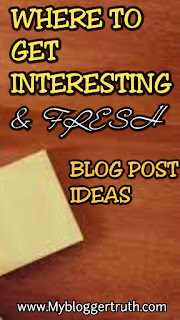 This is amazing way to find good blog ideas that will promote shares." But I don't know who my competitors are”, you may lament. Use can use SEMrush to easily find that out. You can also use google search engine for that, just search for sites using peculiar keywords to your industry or niche. If you have not joined any forums of your niche, do so immediately. You are missing out on potential blog ideas and traffic. You are already belonging to some forums, good! Forums can be very effective in helping you choose what you should write about next. Get involved, ask questions when you need help, and answer questions to help others. Forums are filled with real people having real problems. Choose content ideas from here, based on reoccurring questions. If you have a website that requires constant update daily or regularly. Use Google trends to find current events worldwide or in a particular country of choice. This would help a lot if your niche is centered around, top news, business, entertainment, health, sports, science and technology. Create an alert on Google alert. Get constant and daily updates from niche of your fields around the globe. This will enable you get new information and generate fresh post ideas. Hear me out here, Pinterest is usually underestimated. But guess what, Pinterest recently hit a 200 million active users mark. It keeps growing daily. Now you can also use it to get interesting blog ideas. All you have to do is use the search button, and with relevant keywords you can find out the most engaging pins. So, if you aren't already active on Pinterest, I guess it’s time. This is a habit you should adopt. If you want to deliver the best to your readers, you need to read more. Find out what's new, comment, and also read what the audience found useful by reading comment sections. Be consistent, develop the habit of reading other bloggers blog and engage with them from time to time. If you are constantly looking to discover new stuffs, stumble upon is the way to go. It is a social site where you can get different post ideas for future articles by using your different likes/interests specific to your industry or niche. Then you start stumbling on different pages with different blog post ideas until you find an idea you are interested in, then you write it down. The use of long-tail keywords always yield the best results. Search daily for low competitive keywords, and tap into some real traffic. Use good tools to effectively find competitive keywords on your specific niche. I would suggest using Google keywords planner which is free and integrated with google AdWords or SEMrush -Where you just need to add your site URL to get keyword suggestions. The whole point of writing any content is for lots of people to read, like, comment and share. And what do people like, things that are intriguing, interesting or funny. Spice things up a bit. Compare, contrast and contradict known ideas in your niche. It can be from an old post that you want to develop, or a popular idea that you don't just agree with. Share your personal experiences as well, no matter how little. People do love reading opinions based on personal experiences, they can easily relate to it. You can also interview other people and write on them on experiences. You can use Alltop to search for popular contents of your niche. In the case study below, I searched for contents under accounting. Clicked on accounting and it immediately gave me results on the accounting niche. Alltop is also a top web directory to submit your website to for good backlinks. Cultivate the habit of writing out any and all post ideas you come from any of these sources, leave nothing out. Well, if this article helped you in any way, comment. 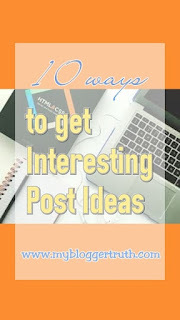 Let me know which of the points mentioned above on how to generate fresh and interesting ideas was most useful to you. wow, this was one amazing read. have bookmarked your URL and definitely following these tips for my next writing ! thanks a ton. I'm glad you found it helpful to you. You're very welcome Harneet. These are some great tips! I definitely agree with #3. It's where I get most of my inspiration from! Yes, forums do help a lot in helping one decide their next post ideas. If your desire is to help people with your blog. There is no better way than to find out through forums the issues they are really facing and what you can do to help. very informative, especially for those who are running blog full-time! I honestly see my blog as my authentic side passion so I never have problems to find an inspiration! :D But thx for sharing! Totally great tips, these are really great ideas for writers block! I totally bookmarked this so I can read this over and over again. Great tips! I haven't tried Google Alerts yet, but will try it out. Thanks! OMG thank you for the suggestions, I so use Google Alerts but these other suggestions will come in handy for sure. That's good to know Juli. Happy to be of help to you. Very helpful!! I am no the most creative person so I run out of ideas pretty quick, this post should come in handy when I do. Thank you for sharing!